1.In blender, pulse shallot, basil, vinegar, sugar and 1/4 teaspoon salt until combined; with blender running, slowly add oil in a steady stream and purée until smooth. Makes about 1 cup. 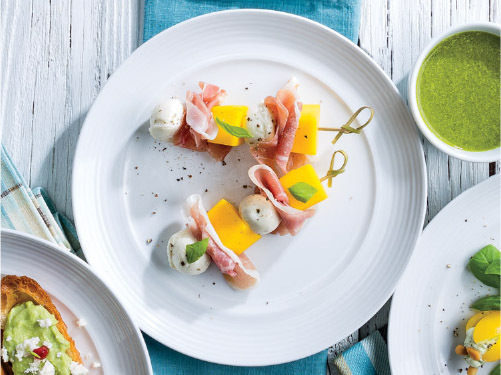 2.Alternately thread mango, prosciutto and mozzarella onto skewers; place on serving plate. Drizzle skewers with 1/4 cup basil vinaigrette and sprinkle with remaining 1/4 teaspoon salt and pepper; garnish with basil.